Bones is a darkly amusing procedural drama centered on a highly skilled forensic anthropologist Dr. Temperance Brennan (Deschanel) whose expertise lies in her uncanny ability to read clues left behind in the victim’s bones. She partners with an FBI agent (Boreanaz) on murder investigations when the standard methods of identifying a body are useless. The show may be called Bones, but in my mind it's all about Booth - David Boreanaz. Over the years I've grown fond of the team at the Jeffersonian but it's Booth I love. David Boreanaz is just so pretty (a very manly kind of pretty) and I'm really excited to see the show on blu ray and I'm hoping this is one of the seasons where he takes off his clothes! I feel like it should be disclosed that I begin the show with an extraordinary attraction to David Boreanaz and I wouldn't be surprised if that clouds my judgment a little. It's a little bit X-Files, a little bit CSI, and a little bit soap opera - and probably very entertaining to people not attracted to David Boreanaz...I just don't know any who watch the show and can vouch for that. 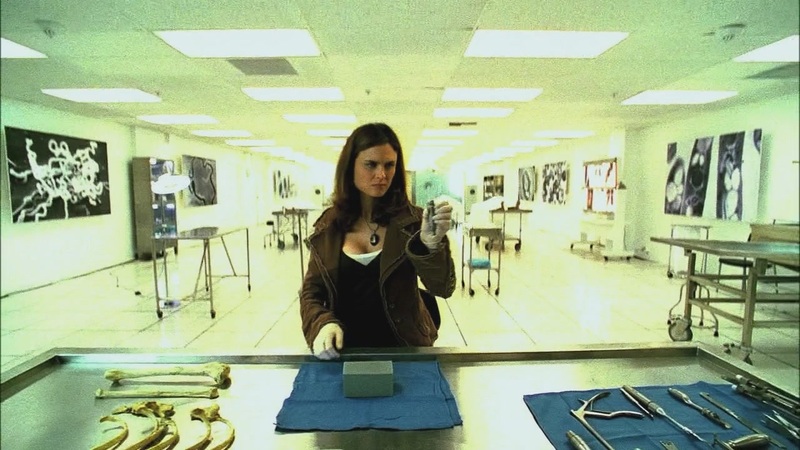 Bones stars Emily Deschanel as Dr. Temperance Brennan, lead "squint" (scientist) at the Jeffersonian Institute. She was affectionately nicknamed "Bones" by her partner, FBI agent Seeley Booth (David Boreanaz). Bones is a forensic anthropologist and Booth and her work together by solving murders that start with little information and often gooey, partial and unrecognizable remains. Bones' team is made up of artist Angela (Michaela Colin), and her husband entomologist Dr. Jack Hodges (T.J. Thyne). Technically, the boss is Dr. Camille Saroyan (Tamara Taylor) but in my opinion, it's Bones' team. Dr. Lance Sweets (John Francis Daley) is the last member of the group. Sweets is an FBI psychologist who originally worked with Booth on previous anger issues (he shot a clown) and he now supports Bones' team with psychological insight while trying to understand the relationship between Bones and Booth. The Mastodon in the Room - The team returns and rallies to save Cam's career. The Couple in the Cave - A unidentified couple is found in a cave. Hannah returns to DC and Bones must face the fact that she makes Booth very happy. The Maggots in the Meathead - Richie "the V" Genaro is found murdered and Bones learns about reality shows, and pop culture. The Body and the Bounty - A pair of hands and a skull are found in a dumpster and the team learns they belonged to a bounty hunter. David Alan Grier guest stars as "The Science Dude" and takes a shot at being the new intern. The Bones that Weren't - Bones and Booth investigate a ballet dancer's murder and Hannah has her own near death experience. The Shallow in the Deep - Remains are found in a 150 year old slave ship, and Cam discovers a very personal connection to the case. The Babe in the Bar - The world's largest chocolate bar contains human remains. Cam is overly concerned in her daughter's college choices. The Twisted Bones in the Melted Truck - Burnt remains are found in a truck and Booth and Bones are lead to a local high school to investigate. The Doctor in the Photo - A surgeon's body is found with skull fractures and Bones retraces her final moments to solve the case. The Body in the Bag - Bones confronts Hannah after she has been avoiding her and her past with Booth. Bones, Booth and Cam are covered in human remains while investigating their latest murder. The Bullet in the Brain - The Gravedigger has her final appeal before being sentenced to death. Nothing with the Gravedigger is as simple as a death sentence. Arnold Vosloo guest stars as a sniper Jacob Broadsky from Booth's past. The Sin in the Sisterhood - The body of a polygamist man is found in a cornfield and the wives turn out to also be sisters, and suspects. The Daredevil in the Mold - A BMX rider is found dead and the investigation must determine if it was a failed stunt or murder. The Bikini in the Soup - On Valentine's Day, a wedding planner is found dead. Cam wants the case solved in time to not disturb her own Valentine's Day plans. The Killer in the Crosshairs - Broadsky returns and Booth uses his training to attempt to stop him before another person dies. The Blackout in the Blizzard - Booth and Bones are trapped in an elevator during a blizzard and a blackout. At the same time, the team has a murder to solve that could be connected to an infectious disease. The Feet on the Beach - A flood reveals eight pairs of dismembered feet, which leads the team to a nearby body farm. The Truth in the Myth - The host of a television mythbusters-type show is found murdered and the Chupacabra is the suspect. The Finder - A security guard has been murdered and a treasure hunting plot is revealed. The Pinocchio in the Planter - An advertising man is found dead and his brutal honesty may have created many enemies, and possible suspects. The Signs in the Silence - A 15 year old deaf girl is found covered in blood, holding a weapon. The team must determine how to communicate with the girl and determine if she is a killer or victim. The Hole in the Heart - The search for Jacob Broadsky continues and a member of the team is lost. The Change in the Game - Booth and Bones go undercover in a bowling league to solve the murder of a man whose remains were found in the pinsetter at a bowling alley. Bones reveals a big secret that will change everything. Bones season six is presented in widescreen, 1.78:1 ratio. Contrast is good and colors are bright and vibrant when necessary, deep and rich at others. The only thing I didn't like was the way the 20th Century Fox logo looked - a little pixilated. The show itself looks great with even and appropriate skin tones. Bones season six is presented with a DTS-HD Master Audio 5.1 mix. Dialogue is clear and consistent and the blood curdling screams make good use of the surround sound. This is primarily a front heavy mix but the rear speakers do see a little action. Subtitles are available in English SDH, Spanish and French. The quantity and quality of the features is excellent, I just wish they were all on one disc. I like it when TV shows put the features on the last disc only. Big bonus for having a gag reel! Extended Episodes - Extended versions of "The Daredevil in the Mold" and "Bikini in the Soup". Commentary for the Blackout in the Blizzard - Commentary by Emily Deschanel and David Boreanaz. Breaking Down: The Blackout in the Blizzard - A featurette with interviews with the cast about the blizzard episode which David Boreanaz directed. The Visual Effects of Bones - A featurette about how the visual effects used in the show to make the corpses, body parts, etc. All I have to say is eww. Surprisingly, visual effects are used to enhance scenes making dark skies blue, adding background actors and changing the scenes themselves. Gag Reel - Watch the cast flub their lines and mess around. For some reason I was surprised that Emily Deschanel swears as much as David Boreanaz when she messes up. The Killing pilot - The pilot episode of The Killing. I've never heard of this show and wasn't impressed. Clearly I was a fan of Bones long before season six. I really enjoyed watching it on Blu-ray and don't like to wait a week in between episodes as is required on TV. I managed to blow through this season in one weekend and now I'm a little sad it’s over. I've admitted to my love of David Boreanaz but I have to admit that it’s got a great cast overall - it’s not just David carrying the show.